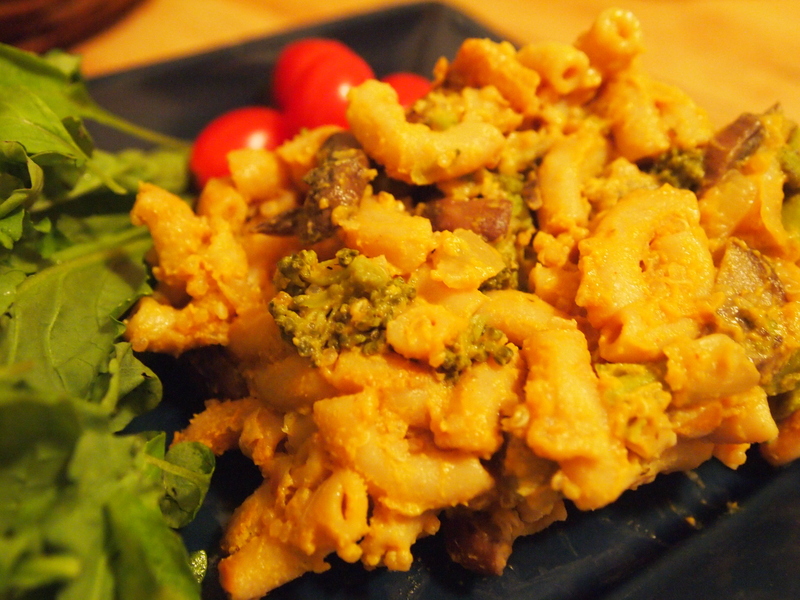 I do not believe that I have ever had a vegan mac and “cheese” that tastes like the original, but that does not mean that they are not also good. This recipe creates a savory sauce with mushrooms, nutritional yeast, and Peruvian Aji Amarillo and ups the nutritional ante with fresh broccoli and quinoa. Heat butter in a large skillet. Add mushrooms and saute until they have expressed liquid. Add onion and garlic to saute and continue cooking until onions are tender, about two minutes. Stir broccoli into the saute. Cover and reduce heat to low allowing broccoli to steam until bright green and tender, about three minutes. Stir cooked quinoa and pasta into the vegetables and set aside. To make the sauce, combine squash, nutritional yeast, paprika, soy milk, Aji Amarillo, soy sauce, and balsamic vinegar in a blender and combine until smooth. Season with salt to taste. Pour sauce over vegetable saute and noodles and return to heat until the sauce begins to bubble. Bake in the oven at 350 degrees Fahrenheit for 20 minutes. Allow to cool for 15 minutes before serving.